This post contains details of episodes of The Apprentice and The Apprentice: You’re Fired, although it doesn’t discuss which teams lose or who has been fired in any week. Minutes after The Apprentice finishes airing, Jack Dee and an array of pundits arrive on our screens to dissect the goings on of the task and the teams. This week, we were treated to a particularly neat demonstration of the differences between men and women. Clips are shown of project manager Vana Koutsomitis clashing with fellow team member Selina Waterman-Smith, with Selina questioning Vana’s decisions but being shut down by her temporary leader. “Catty,” murmurs one pundit. 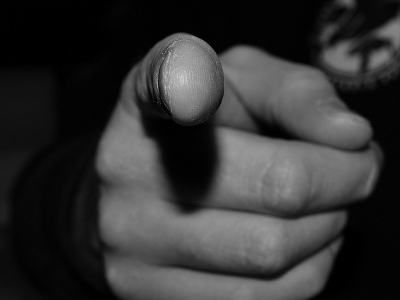 Another points out that for women in business, all too often an attempt to be assertive can turn into being “stroppy”. Immediately following this, the opposing team’s friction is shown, with this week’s project manager Joseph Valente becoming irked by last week’s project manager Richard Woods, whom he perceives to be too controlling while not negotiating well enough. The clip ends with a scene in the boardroom, which shows a not exactly articulate exchange of views. You may not be surprised to discover, however, that this behaviour – weirdly similar to that displayed by Vana and Selina – is deemed to be typical “alpha male” stuff. Let’s be clear: neither team comes across as perfect in their approach to business. However, the way they are described makes the women seem particularly petty and unready for the challenges before them and reduces them to the level of children in a playground, while the disturbed hierarchy among the men is addressed as a more serious, adult and therefore reasonable and surmountable issue. I know I shouldn’t expect too much from The Apprentice. This is, after all, a show which in its 11th series started off with the big reveal that teams wouldn’t be split into women and men for the first task. Even this was so novel that the teams were rearranged after the first task to be back to the much more familiar make up of members of the same gender. This is a set up that cries out for dubious comparisons to be made between women and men in business – the format itself guides us to make them. So while I think the show itself is perhaps irredeemable, I still found it striking to hear a panel mark the perceived differences between the women’s and men’s teams so clearly, while showing and describing similar scenes. It underlines the barriers that women are more likely to face when trying to get ahead – after all, doesn’t it sound better to be alpha or competitive than to be catty, stroppy, bitchy or bossy? Even when women are approved of for being suitably assertive, this is often described as feistiness, which somehow comes across as more patronising than words used to describe men acting in similar ways. I would certainly implore people who comment on business and those who appear on panels such as this one on The Apprentice: You’re Fired to consider the language they use and to think about whether they would say the same thing about a man if they are saying it about a woman. If not – why not? There are several hundred other points that could be made about The Apprentice and its representation of women in business. This just happened to be the trigger for me this evening. And that’s only do to with how the format and show itself deal with gender – the candidates seldom cover themselves in glory when on the subject either. Is there anything that has particularly bothered you this series? 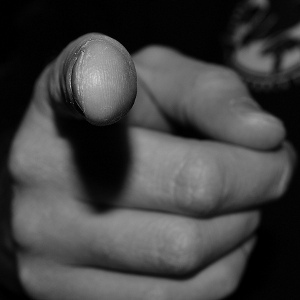 The black and white image shows a finger pointing towards the camera. A bit like when Alan fires people. But not an image from the show – this is by Marc Smith and is used under a creative commons licence. The second image is a screengrab from the show itself, copyright Boundless and used with permission. It shows three candidates – Elle Stevenson, Vana Koutsomitis and Jenny Garbis – in the boardroom. As a few people helpfully pointed out on Twitter – of course, just as using words like catty to describe women is frustrating, using words like alpha for men is also problematic – and reinforces tired assumptions about the nature of masculinity.